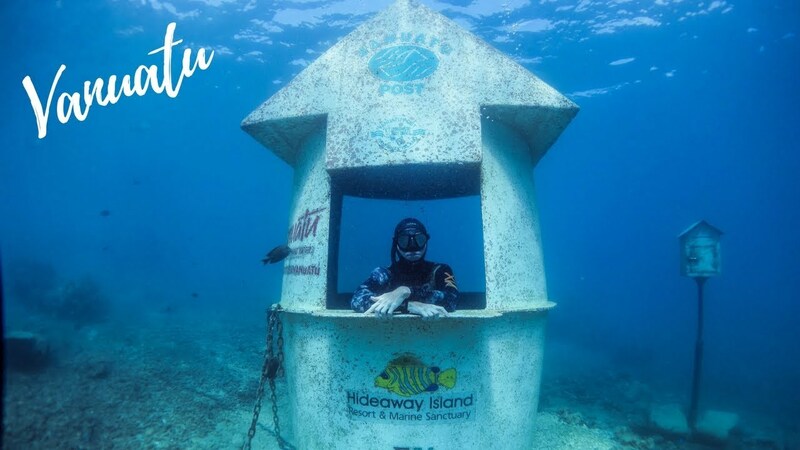 The underwater post office off of Hideaway Island in Vanuatu may have been the first underwater post office for scuba divers, but no longer. Japan has underwater postal services now as well. In fact they have the deepest underwater post box in the world. Perhaps the distinction comes when you consider that Vanuatu has a post office as well as a post box, whereas the underwater postal services offered in Japan is only via a post box. Nonetheless, these underwater mailboxes are very popular among scuba divers and free divers as well. The Vanuatu post office is located about 160 ft off the coast of Vanuatu. The underwater post office was constructed out of a fiberglass water tank and it lies about 10 ft below the surface. It opened in 2003 and was the idea of the local resort owner and local postmaster over drinks to make it possible for vacationers to send post postcards form below the surface. Vanuatu, aside form its underwater mail delivery, offers great diving experiences as seen in the video below. So as it turns out the Vanuatu may have been first, but Japan now also has an underwater post office just off a small seaside town of Susami. However, this post office holds the Guinness Book Of World Record’s as the deepest underwater post office. So it is really an attraction for scuba divers that want underwater postal services. See the next page below for more about this under sea post box became a destination for divers.